DBT has been adapted for treating some clients with eating disorders and focuses on skills that increase mindfulness, appropriately regulate emotion, and safely tolerate distress. Social workers who engage with clients who have eating disorders know all too well about treatment failure and relapses and about their potentially devastating consequences. Experts suggest that when standard treatment for eating disorders fails to produce results, it’s often because patients may have multiple eating disorder diagnoses along with comorbid Axis 1 or 2 disorders; thus, progress may be impeded by more serious emotional dysregulation, more complicated eating pathology, and impulsive and self-destructive behaviors. According to Lucene Wisniewski, PhD, FAED, cofounder of the Cleveland Center for Eating Disorders and an adjunct assistant professor at Case Western Reserve University, some individuals with eating disorders are “supremely emotionally sensitive” and may self-harm as a way to regulate emotion. She says data suggest that 40% to 50% of individuals with eating disorders have depression, 30% to 40% have anxiety, and about 33% have personality disorders. One method to treat such complex cases of eating disorders is dialectical-behavior therapy (DBT), which is intended to help patients develop more adaptive ways to regulate emotion and to analyze and restructure behaviors that arise from emotional dysregulation. To that purpose, it focuses on skills training and helping patients to increase mindfulness, appropriately regulate emotion, and safely tolerate distress. Its name derives from the dialectical tension between acceptance and change, each being important components that are integrated into the therapy. DBT developed from the efforts of psychologist Marsha Linehan, PhD, to adapt cognitive-behavioral therapy (CBT) to treat people with chronic suicidality and urges for self-harm, many of whom also had borderline personality disorder (BPD). Used in inpatient, residential, and outpatient treatment, DBT, a multimodal cognitive-behavioral approach, has since been adapted in several ways for people with eating disorders who, like those with BPD, may have difficulty regulating their emotions. It’s been used as a treatment for the complex cases of eating disorders described above and also in a modified form for less complicated cases in which other first-line approaches alone have been unsuccessful. Hilleary says one core assumption of DBT is that clients are doing the best they can to cope. “The opposite of this would be that they aren’t coping well and they need to do better. DBT would look at it dialectically and say both are true. They are doing the best they can, and they can do better.” She says this is how DBT focuses both on acceptance and change strategies. “As strange as it sounds, eating disorder behaviors are often individuals’ best efforts to care for themselves,” Gerson says. “While overall destructive, these behaviors can also be calming, distracting, freeing, and pleasurable.” DBT is a tool with which patients can learn other more beneficial ways to comfort themselves, relax, and feel more pleasure, she says. According to Hilleary, the traditional model for DBT therapy has four components: individual therapy, skills training groups, team consultation for the therapist, and telephone coaching by the individual therapist when the patient is in crisis. “So, in its most adherent, it includes both individual and group work,” she says. At Ridgeview Institute, “We teach skills groups every day and have our front-line staff do skills coaching with patients as needed,” Hilleary says. Patients fill in daily diary cards to track the target behaviors they are working to reduce (eg, bingeing, purging, overexercising, taking laxatives and diet pills). The diary cards also track their use of the skills they’re striving to develop. As noted previously, the DBT model for multidiagnostic patients with comorbidities has been adapted for use in simpler cases involving individuals with less complicated issues—”uncomplicated meaning only Axis 1 bulimia nervosa or binge-eating disorder and without comorbidities,” Wisniewski says. It’s estimated that one-half of patients with bulimia and binge-eating disorder fail to improve with standard treatment methods. When CBT alone does not resolve bingeing or binge and purge behaviors, DBT’s focus on emotion regulation may be more promising. This adapted model of DBT for eating disorders, Wisniewski explains, focuses on only one DBT component: skills training. But as with its use in more complicated cases, DBT is not the first line of treatment for patients with binge-eating disorder or bulimia nervosa, Wisniewski says. “It’s longer, more complicated, and more costly,” she explains. “I personally would not start with DBT; I’d begin with standard CBT because it has the most empirical support.” She says an exception may be a patient for whom emotional dysregulation clearly was a main precursor to bingeing and purging or bingeing. In a case like this, she’d consider the simple DBT. Wisniewski quickly explains that adolescents “are a very different picture. Family-based therapy, also called the Maudsley method, is the treatment of choice for patients aged 18 and younger who have been ill for three or fewer years and are living at home.” At the Cleveland Center for Eating Disorders, treatment for all adolescent patients begins with family-based therapy. “If there is treatment failure and/or suicidality and dysregulation, and patients are multidiagnostic and not responding to family based-therapy, we’ll add in DBT,” she says. In the treatment of outpatients without comorbidities or multiple diagnoses, DBT is almost always used in conjunction with CBT, which “is the treatment that has the most data behind it,” Wisniewski notes. Similarly, Gerson observes that individuals with more impulsive behaviors such as bingeing or purging “tend to embrace the skills more readily. People usually experience behaviors like bingeing and purging as more distressing than restriction, which is often ego syntonic, so these patients tend to be more motivated to learn skills that will help them decrease the behaviors.” That being said, she still labels DBT as “an excellent intervention” for any form of eating disorder. “Restriction, bingeing, purging, and overexercising function as ways of coping; learning alternative strategies to cope is key to extinguishing these behaviors. DBT will isolate any behavior or symptom as the target,” she says. “Although traditional DBT was not designed for the spectrum of thoughts and behaviors that patients with anorexia struggle with, there is a lot in the therapy they can connect with,” Hilleary says. Aspects of DBT that have proven useful for Hilleary’s patients with anorexia include mindfulness skills, interpersonal effectiveness, and understanding the model of emotions as DBT explains it. But while she uses facets of DBT with patients with all types of eating disorders, she doesn’t consider it a primary mode of therapy for an outpatient client with anorexia. Wisniewski says social workers who want to work with the most complex populations that involve individuals with multiple diagnoses and comorbidities will need significant training both in eating disorders and DBT, which is a big commitment. Clinicians typically have training on one aspect and not the other; she says it’s rare to find someone who knows both. According to Hilleary, efforts to create a certification process for DBT therapists have not yet been successful, so there are no firm criteria for practicing DBT. “There are many one- or two-day DBT workshops therapists can attend to become familiar with DBT, but intensive training is recommended to qualify a practitioner,” she says. Wisniewski says that for social workers who wish to work with complex multidiagnostic patients using the full model of DBT, there are opportunities for training such as those offered at her home base, the Cleveland Center for Eating Disorders, and in programs offered at the Academy for Eating Disorders International Conference. 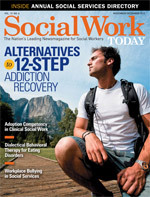 In addition, two companies provide what Wisniewski describes as “first-rate training”: Linehan’s Behavioral Tech (www.behavioraltech.com) and the Treatment Implementation Collaboration (www.ticllc.org). Social workers who wish to provide an adapted version of DBT to less complex patients—those with binge-eating disorder or bulimia nervosa and without comorbidities—will require a general background in DBT but less rigorous training. An easy and useful place to start, Wisniewski suggests, is with a comprehensive guidebook, Dialectical Behavior Therapy for Binge Eating and Bulimia by Debra L. Safer, Christy F. Telch, and Eunice Y. Chen.